What to do about phragmites is difficult and controversial, so we hoped to sparked a dialogue. 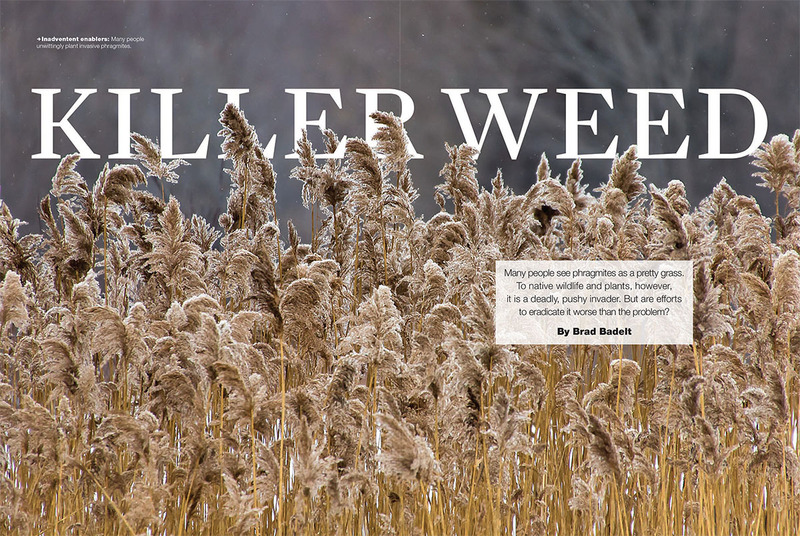 We have received some thoughtful responses to Brad Badelt’s feature article “Killer weed.” Here are several letters from readers who care deeply about the environment, but hold different perspectives on phragmites. Where do you stand? In 1993 I moved from Ontario to Texas where I worked for the Lady Bird Johnson Wildflower Center. In the summer of 2016 I spent a few weeks on the shore of Lake Erie in the Niagara Region. Driving around I noticed a tall densely growing plant that I didn’t remember ever seeing when I lived in Ontario. Last year I made a move back to Ontario, and settled in Amherstburg. In my movements around Essex County here was this same tall grass seemly everywhere. Speaking with a local vendor of native plants I learned that it was the exotic invasive, phragmites. I was amazed that it had spread so quickly over much of Southern Ontario. As the article in the winter edition of ON Nature pointed out, the easiest way to control it is with herbicides, but that is a controversial process. I wondered if there wasn’t a natural craft that might be made from the weedy stalks, but the only one I could come up with was hand paper making. Another possibility is biogas generation. Something needs to be done about the spread of phragmites, and I’ve outlined a couple of ideas that don’t involve herbicides. I read this article with interest. As a former guided hike leader with Rouge Park, I often pointed out the large stands of this plant throughout the park as an example of an invasive plant. However, the article itself points out the solution: phragmites can thrive in salt water; our native cat tails and other wetland plants cannot. We must drastically reduce our reliance on salt for winter safety because this salt is making its way into our waterways and creating an environment that favours the success of this invasive plant. Just yesterday I heard on the radio that scientists have measured salt concentrations equivalent to sea water in waterways adjacent to Ontario highways! That is extremely disheartening news. Municipalities and provincial agencies must work together to set new standards that limit the use of salt, and begin relying more on sand and other alternatives to keep roads and sidewalks safe in the winter. Thank you for such an interesting magazine. I read Brad Badelt’s feature “Killer weed,” and this is the type of article that is needed to gain public awareness, and hopefully public support in volunteering to help to solve this problem. The Blue Mountain Watershed Trust Foundation has been actively involved since 2010 when we noticed phragmites in the Collingwood, Blue Mountains areas – particularly in protected areas along the shoreline. Since that time, the Trust and our partners NVCA, Georgian Bay Forever have organized cutting events that have helped bring this issue to the public’s attention. In-turn the public have come out to help in the cutting over the past years. With respect to the trial use of glyphosate referred to in this article, it is confusing. Depending on the manufacturer, the Material Safety Data Sheets for Glyphosate use in or near the water (the aquatic environment) range from “slightly toxic” to “not to be used”. On July 1, 2017, California listed glyphosate as a chemical known to cause cancer. Lawsuits have resulted and there is considerable debate in the European Union countries both for and against its use. What I believe is lacking is the requirement to monitor the impact not just for health reasons, but also the environment. This could be done in control plots, rather than large scale trials. I know in Collingwood along Highway 26 at the Provincially Significant Wetland there is a stand that has been treated for several years with glyphosate, which has experienced regrowth and there are a number of dead trees in the area. I assume caused not by past herbicide usage, but the impact of a toxin found in invasive phragmites’ root system. I would like to address the issue of applying Roundup to wetlands in Ontario, and specifically to Long Point and Rondeau Provincial Park. I presume that the Invasive Species Act was the legislation which allowed the MNR to grant Janice Gilbert an emergency permit to aerially spray Roundup Custom. An online search for Roundup’s Canadian label informs the reader that the PMRA classifies Roundup as a Class 9 herbicide “toxic to aquatic organisms and non-target plants. Avoid direct applications to any body of water” and sets out in S5.3 (iii) the buffer zones required for sensitive aquatic habitat “such as lakes, rivers, sloughs, ponds, coulees, prairie potholes, creeks, marshes, streams, reservoirs and wetlands.” Somehow, the Roundup label and contraindications for its use over water were cast aside to grant the emergency permit. The reason glyphosate application is controversial is partly because it is restricted due to its toxicity to aquatic organisms and non-target plants. There are other concerns. The World Health Organization listed glyphosate as a probable carcinogen in 2015. This summer California listed it as a carcinogen. Studies question the safety of glyphosate. Dr. Rick Relyea of Penn State found in 2005 that glyphosate caused “extremely high rates of mortality to amphibians” and could be responsible for their decline. Nature published on January 9, 2017 the study, “Multiomics reveal non-alcoholic fatty liver disease in rats following chronic exposure to an ultra-low dose of Roundup herbicide.” These are but a few recent studies questioning the safety of exposure to glyphosate. The surfactants used with glyphosate are not regulated by PMRA and studies have found them in some cases to be more toxic than the active ingredient. In August 2017, Monsanto’s integrity was questioned. Your article assures readers that experts such as David Hawke find pesticide application to be the most effective method of treatment for phragmites removal. 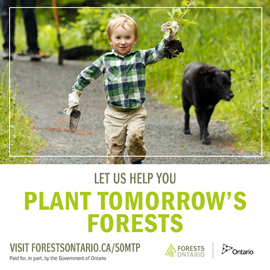 I wish that Ontario Nature would reconsider this promotion. My cottage area has phragmites growing along the shoreline, at a beach in Georgian Bay. My local municipality was determined to treat them with Roundup with POEA, and I have been arguing for many years to dissuade them from doing this. Years later, the plants seem to be getting removed without resorting to pesticides. 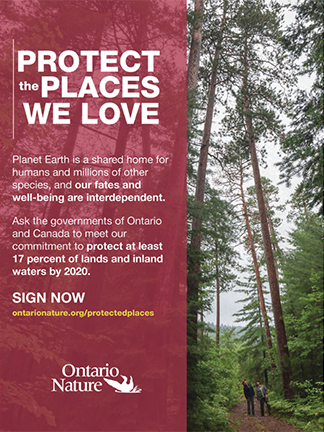 The reason I felt strongly about this is because I have witnessed the decline of the aquatic environment at my cottage over decades, well before the phragmites showed up. I have seen the decline or loss of species like sand pipers, seagulls and aquatic snails. Crayfish had a major die off in the mid-90s, and you would be hard pressed to find one there now. I have seen the sturgeon and waterfowl washed up on the shore in huge numbers from type E botulism. Minnow numbers are way down. Garter snakes are just a memory. There are very few ladybugs or monarchs to be found any more. I observe declining amphibian numbers, with the last parcel of wetland in my neighbourhood clear-cut, divided and sold for new homes while the beach was scraped of rocks and driftwood, as well as other shoreline plants. Algae have been present for decades. Some years it has been so thick, it created a pudding-like mass that extended many feet out from the shoreline. The once clear waters I swam in as a kid now always have floating algae particles, and the only time the water clears is with a stiff offshore breeze. Intensive pig farmers spread manure year-round, and you can smell the waste applied to the fields most days on the beach. I understand that it is spread in winter as well, when the fields are frozen, and not able to absorb the nutrients, washing straight into the lake. When zebra mussels invaded the area, at first their numbers were high, but then even they declined to only a few. They apparently couldn’t handle the pollution either. The thought that pesticides would be added to the challenges my lake suffers from is not something I take lightly. I understand from surveys that the scale of the phragmites invasion in Ontario is huge. If all the phragmites growing were to have Roundup application, that would be a lot of pesticide released into our waters. We now know that there is a risk associated with exposure, and that the pesticide label specifically states not to use them over water, or within the buffer zone. So why is the phragmites situation considered dire enough to override the pesticide label, when other solutions exist? I understand that when Roundup is used to treat phragmites, it can’t completely eradicate them, so Roundup must be applied every few years, meaning more exposure for people who use our water resources recreationally, for household consumption, and for the animals that require these environments to survive. In looking closer at phragmites, have you ever wondered why they thrive in our lakes and wetlands?!? In my cottage area, I think it is because the water has too many nutrients. I discovered that phragmites are beneficial against eutrophication and enhance water quality by retaining total nitrogen and phosphorus in soils. If phragmites were reduced in number would the water quality get worse? Are they thriving because we have allowed our waters to be too nutrient loaded? Perhaps the better way to reduce their numbers would be to tackle the high nutrient loads washing into our water sources. In my cottage area, the phragmites the municipality wanted to spray became submerged by higher water levels in the lake in 2016 and 2017, and most of the plants the municipality wanted to spray died from the natural cycle of the lake. The remainders are being dug out with shovels. I think we are better off for not having released pesticides into the water there. My observation with the plant has been that humans can remove phragmites by hand, simply by cutting them below water where they are submerged or by removing the horizontal above-ground stolons, and by digging up the rhizomes. In an era when Canadians are being told to bike rather than drive, maybe we should get up off the beach and get exercise removing invasives. A bit of physical effort on our part would avoid the necessity of carcinogen exposure. Seems like a good trade. Ontario has a lot of phragmites. Your article hints that the way forward is through pesticide application. I think this is trying to pick the lazy, easy way without acknowledging health risks of exposure to people and the environment, and brazenly ignoring the warning on the label which is the legal document that directs use. Please consider doing a story on alternative removal techniques for invasives, or at least stop promoting Roundup. You alluded to alternative opinions, but your article essentially promoted spraying Roundup, which is disappointing for an environmental association.